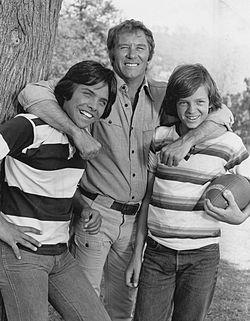 The Fitzpatricks is an American drama series which ran on CBS during the 1977–78 season. The series premiered on September 5, 1977; it lasted thirteen episodes, and was cancelled on January 10, 1978, failing in the faces of established ABC competitors Happy Days (in its first 30 minutes) and Laverne & Shirley (in its last 30 minutes), which both aired in the show's time-slot of 8:00-9:00 PM Eastern/Pacific on Tuesday nights. The focus was on the Fitzpatricks, an Irish Catholic family of six who lived in Flint, Michigan. The father, blue collar, Mike Fitzpatrick (Bert Kramer) worked overtime as a steelworker to provide a life for the family; while his pregnant wife, Maggie (Mariclare Costello) also worked part-time at a diner as a waitress to help support the family's income. 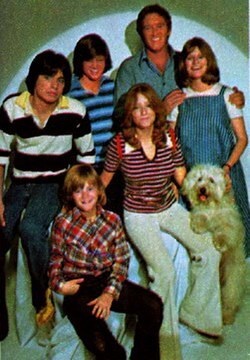 They had four children, eldest son, Sean (Clark Brandon); introspective second son, Jack (Jimmy McNichol); only daughter Maureen (nicknamed Mo) (Michele Tobin) and youngest son, Max (Sean Marshall). At various times, all of the Fitzpatrick children had held down part-time jobs to help the often cash-strapped family. They also owned a dog, aptly named Detroit. Also involved in the family was R.J. (Derek Wells), who was Max Fitzpatrick's African-American best friend. A young Helen Hunt played neighbor, Kerry Gerardi, supposedly a friend of Mo's, who was interested in the older Fitzpatrick brothers, Sean and Jack, which sparked a bit of a rivalry between the two. Much of the stories deal with moralistic lessons and also with growing up. Bert Kramer as Michael Fitzpatrick, a steelworker, and the patriarch of the family. Mariclare Costello as Margaret "Maggie" Fitzpatrick, the matriarch, works part-time at a diner to supplement the family income. Sean Marshall as Max Fitzpatrick, the youngest at 10, delivers newspapers. Helen Hunt as Kerry Gerardi, the girl next door, who intensified the rivalry between Jack and Sean. Derek Wells as R.J., Max Fitzpatrick's best friend. ^ Tim Brooks; Earle Marsh. The Complete Directory to Prime Time Network and Cable TV Shows, 1946–Present. 8th ed. Random House Digital; October 14, 2003 [cited September 27, 2011]. ISBN 978-0-345-45542-0. pp. 414–415. Wikimedia Commons has media related to The Fitzpatricks.